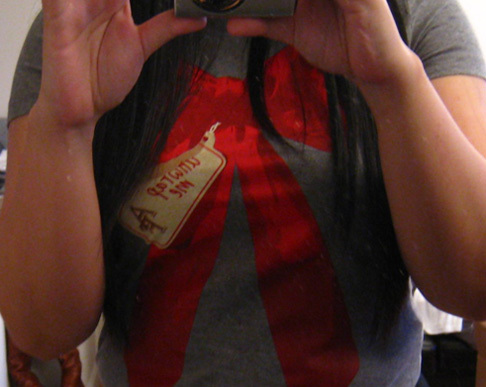 Ok, I couldn’t resist getting another Abercrombie & Fitch Payton Tee, this time, the “Unwrap Me” version. I know it was a holiday release, but I don’t think it’s limited to only holiday wearing, do you? Same awesome fit. 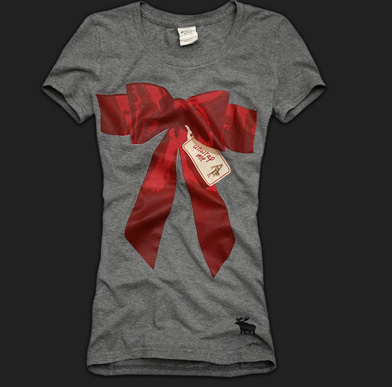 Love the gray color, especially in contrast with the big red bow. Hate the big moose logo. 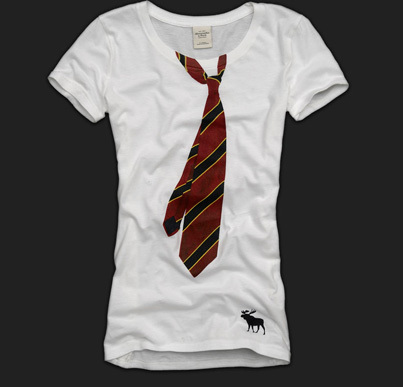 But I can imagine tucking this into some skirt and the whole A&F-ness of it goes away. It’s cute and flirty, and hey, we can all use some more of that. 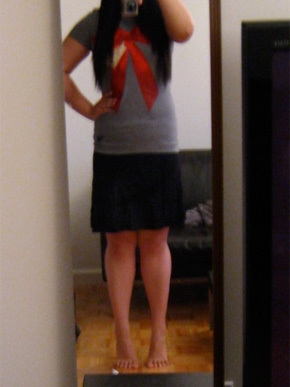 I had a feeling this tee and skirt combo I love so much only works with A-line short skirts, and I think I was right on this one. 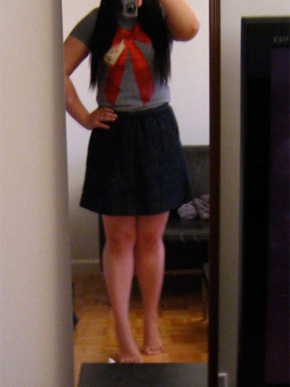 I threw on a simple knit black skirt and the look was definitely infinitely less cute than when I paired the tee with the Indigo Skirt I recently got from J.Crew. 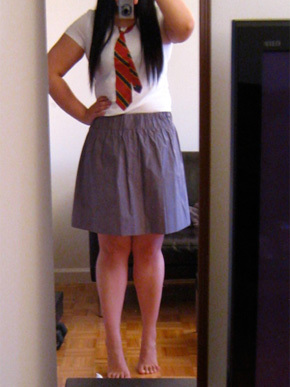 Again, this could just be me, since my waist-to-hip ratio is not that great. Oh, and same puckering issues happen at the chest with the graphic. Still not sure how concerned I should be about that. Sorry for the blurriness of the photos. The sun was setting and the lighting wasn’t great. This tee is on sale now for only $13 at A&F online – get it here! 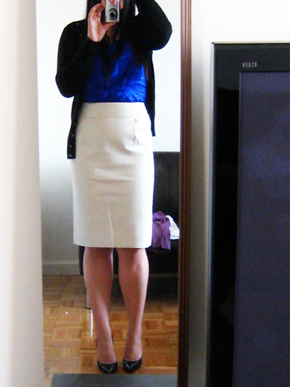 J.Crew’s Double Serge Pencil Skirt is supposed to be the most flattering skirt ever made. Transforms all women of all sizes instantaneously into tall, lean models. 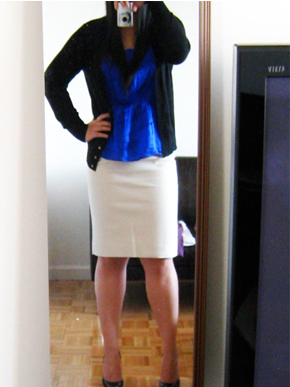 Of course I had to try it, despite my last unfortunate brush with a pencil skirt from J.Crew. 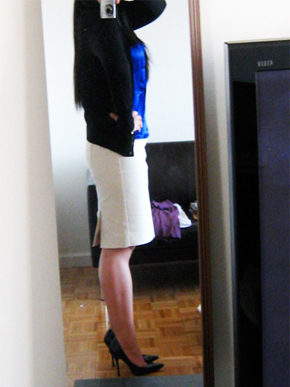 First up – Double Serge Pencil Skirt in Natural. This looked like a true white in the catalog, but in real life it’s more off-white and beige-ish. Not very flattering, is it? Looks just like a plain white skirt. Mehh. 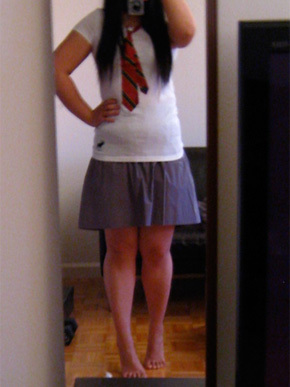 So I thought, c’mon, this is a high waisted pencil skirt. You have to wear it in a high-waisted fashion to really get the appeal of it. Eh. It’s better, but not great. 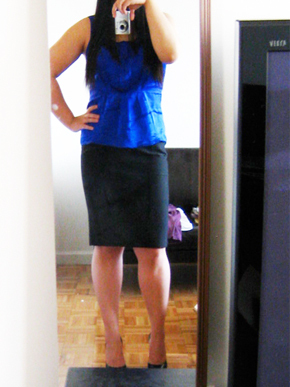 I have to say everything I realized about me and pencil skirts holds true here. I got the Natural in my usual size. Not a fan. Not really. I got the Black in a size down (don’t ask me why), but the fit wasn’t all that different. 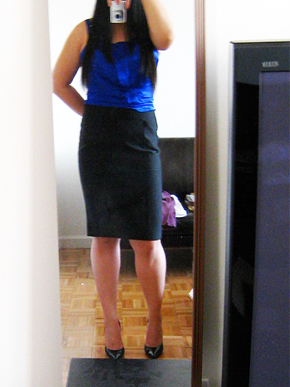 Definitely more flattering than the Natural, but alas, pencil skirts just do not look good on me. Get the Double Serge Pencil Skirt from J.Crew here for $98.